Victor Saville was born in Birmingham on 25 September 1897, the second son of an art dealer. He entered the film industry as a films salesman in 1916 after wounds sustained in the battle of Loos had brought about his army discharge. His salesmanship experience led him to an interest in film production, and with a fellow Birmingham man, Michael Balcon , he produced Woman to Woman (d. Graham Cutts) in 1923. The film was a success. Balcon formed his own company, Gainsborough , and Saville went into partnership with the director Maurice Elvey , for whom he produced five films, including Mademoiselle from Armentieres (1926) and Hindle Wakes (1927). In 1927 he made his directorial debut with The Arcadians and the following year set up his own company, Burlington . In 1929 he went to America to re-shoot some scenes with sound for his second Burlington film, Kitty (1929), and whilst there teamed up with Balcon to direct a remake of Woman to Woman with sound (1929). Saville 's first full British talkie was The W Plan (1930), a spy drama which fared extremely well at the box office. Saville then directed two films for Balcon starring the droll comedian Leslie Henson : A Warm Corner (1931) and The Sport of Kings (1931). Balcon had become head of production at Gaumont-British and between 1931 and 1935 Saville became the studio's most prolific and (with the possible exception of Alfred Hitchcock ) most valued director. 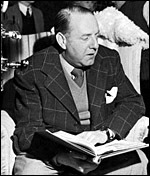 He proved himself equally adept at directing comedies, musicals and serious dramas, establishing Jessie Matthews as a star in films such as The Good Companions (1933), Evergreen (1934) and First a Girl (1935), launching Jack Hulbert onto a successful screen career in Sunshine Susie (1931) and Love on Wheels (1932), and opening doors in Hollywood for Madeleine Carroll with her roles in The W Plan and I Was a Spy (1933). I hope I shall not personally direct many more films. I have never considered myself highly as a director. I know I haven't the brilliance of Hitchcock , Lubitsch or Capra - nor have I the application to settle down like them and perfect, with years of labour, one particular style of direction. I have made scores of films during my career. I have also written scenarios and turned a camera - but my own ambition has always been to produce. Saville had bought the rights to A.J. Cronin 's novel, The Citadel, which, like South Riding , was highly critical of social conditions in contemporary Britain. Louis B. Mayer persuaded him to sell them to MGM in return for the opportunity to produce a big budget adaptation. Made in Britain but with an American director, King Vidor , The Citadel (1938) proved highly popular on both sides of the Atlantic, and Saville 's next production, Goodbye Mr Chips (d. Sam Wood, 1939) was even more successful. When war broke out in September 1939, Saville was in Hollywood, and he was advised that he could best serve his country by producing films there with a pro-British slant. He obliged with The Mortal Storm (US, d. Frank Borzage, 1940), an anti-Nazi film which provoked Goebbels into banning all MGM pictures in German-controlled territories and brought Saville before a Senate committee which demanded his expulsion. He was saved by the attack on Pearl Harbor, and after producing a further eight films for MGM , moved to Columbia , where he directed Tonight and Every Night (US, 1945) with Rita Hayworth . In 1946 he moved back to MGM , but as a director of prestige films like The Green Years (US, 1946) and Kim (US, 1950). He returned to Britain in 1949 to make a disappointingly dull Cold War thriller, Conspirator ; in 1952 to make a melodrama, Twenty Four Hours of a Woman's Life ; and, more permanently, in 1960 to produce his last two films, The Greengage Summer (d. Lewis Gilbert, 1961) and Mix Me a Person (d. Leslie Norman, 1962). He died in London on 8 May 1979. Saville was a versatile and highly competent director who extracted strong performances from his casts, particularly from his female stars - Estelle Brody , Belle Chrystall , Edna Best , Madeleine Carroll , Jessie Matthews , Vivien Leigh and Rita Hayworth - and he was well-liked on both sides of the camera. Surprisingly, in view of the strict censorship of the period, and of Saville 's later career at MGM , the most conservative of the Hollywood majors, many of his films come across as radical and progressive, particularly in their treatment of women. Woman to Woman (1923/1929), Hindle Wakes (1927/1931) (for both of which he produced one version and directed another) and The Faithful Heart (1932) all centre upon unmarried liaisons and invite sympathy and support for their female protagonists. The beautiful spies of Dark Journey and I Was a Spy are brave, principled, independently-minded women rather than femmes fatales. The Good Companions , Storm in a Teacup and, much more directly, South Riding and The Citadel address the issue of British class divisions in a society where economic depression had ruined the lives of many working people, a situation most British film-makers preferred to ignore. Dark Journey and The Mortal Storm speak out against the threat from Germany at a time when appeasement was a favoured strategy (in Britain and the USA respectively) for dealing with Hitler . Though Saville is unique in being an Englishman who pursued a successful career as both a producer and a director in Hollywood (at one time he was thought of as Mayer 's likely successor at MGM ), it is for the British films he directed in the 1930s - particularly for the remarkably moving and far-sighted South Riding - that he will be best remembered.